Resume Tips, tips for hiring, or being hired, and how the tool we rely on the most can sometimes be used against us. Screening candidates for job openings, conducting interviews, and contributing to the hiring process is part of my job. John’s resume was towards the top of the pile, and I began the morning by scanning through each page, and creating my standard “yes” “no” and “maybe” piles. John was in the “yes” pile. Scan each resume and decide as quickly as possible: Is this a yes, a no, or a maybe. Include a brief “snapshot” highlighting your areas of expertise. Write a concise paragraph at the very top of your resume, state your desired position, when you can start, and recap the credentials that most closely align with the position for which you are applying. The paragraph should be about as long as this one, about 50-75 words. 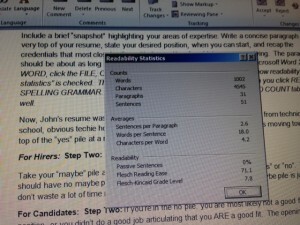 *Tip if you use Microsoft Word 2010, in WORD, click the FILE, OPTIONS, PROOFING and make sure the box “show readability statistics” is checked. 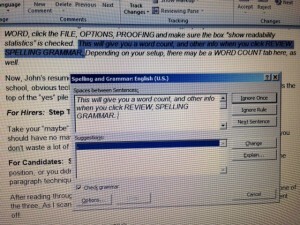 This will give you a word count, and other info when you click REVIEW, SPELLING GRAMMAR. Depending on your setup, there may be a WORD COUNT tab here, as well. And, always put your name and phone number in the footer, so it’s on every page. Now, John’s resume was exactly what I was looking for: Recent graduate from a technical school, obvious techie hobbyist with natural problem solving skills. He was moving towards the top of the “yes” pile at a rapid pace. Take your “maybe” pile and scan more thoroughly, deciding if the resume is a “yes” or a “no”. You should have no maybes when you are ready to hunker down. The maybe pile prevents you from wasting your time reviewing ALL the resumes. For Candidates: Step Two: If you’re in the no pile, you are most likely, not a good fit for the position, or you didn’t do a good job articulating that you ARE a good fit. The opening paragraph technique should help with this. Maybe this is a term used in a legitimate hobby, and I am misinterpreting, I thought to myself (because I was so pleased with Johns’ credentials I wanted it to be this way). I carried on. For Hirers: Step Three: Google everything. One, if not all of these will net results and give you an idea of the kind of candidate you have in front of you. Here is what happened when I googled John. I was inundated with websites, social media, and comments that depicted a young man, who treated women very badly. Very badly, so badly I am choosing to not re-state. John, was a straight-up, dope, women-hating, gangsta. According to his web presence. Now, I’m in a pickle. The kid looked great on paper but horrible on the internet. Here is what I chose to do. I sent John an email, and I stated my enthusiasm for his credentials, and explained that we work with facilities that sometimes do background checks, and they often require a copy of your resume, and any background information that speaks to your character. I then shared with John, my findings on the internet, and my concerns with his email address. Not only for me, but for any potential hiring manager to whom he sent his resume. In closing, I suggested that he might consider getting a new email address, and taking those sights down, at least during the hiring phase of his journey, and if he chose to do this, to please resubmit his new resume through the jobs portal, and I would receive it. I suspected I’d never hear from John again, but I did. John wrote back, and explained he did not realize all of this information was on the internet, and informed me that he had taken the sites down. He shared with me, his new email address, and thanked me for my time. He wrote that he had also resubmitted his resume to everyone, and I would find my copy attached. It didn’t work out with John and this position, but he did email me about a month later to let me know he found a job which he was very excited about. It might take a little more time, but if you have a handful of top candidates and you choose one and not the others, do your best and clearly state why you did not choose candidate A, or explain what candidate B had that gave them the edge. In the event that candidate A simply did not include or focus on a strength, this is something they can revise and be more successful at their next hiring opportunity, or with another company. Google yourself. Like a stalker. Try to find every possible piece of information on the internet. Now, you most likely cannot change most of the information, but you can be educated, and prepared to speak about it, should you be asked. However, the best piece of advice is to remember that most of the things you put on the internet, last forever (or a very long time). Hirers are checking you out. What you write today may be available ten years from now when you are seated across the desk interviewing for your dream job, applying for that business loan for your startup, or looking for investors to launch your next great idea. It doesn’t matter what the rules are, the reality is, managers and investors are doing their homework. Internet search results matter. You are not Tucker Max.